oke, kali ini saya akan share software utilitis, yang saya ambil dari bang agung. 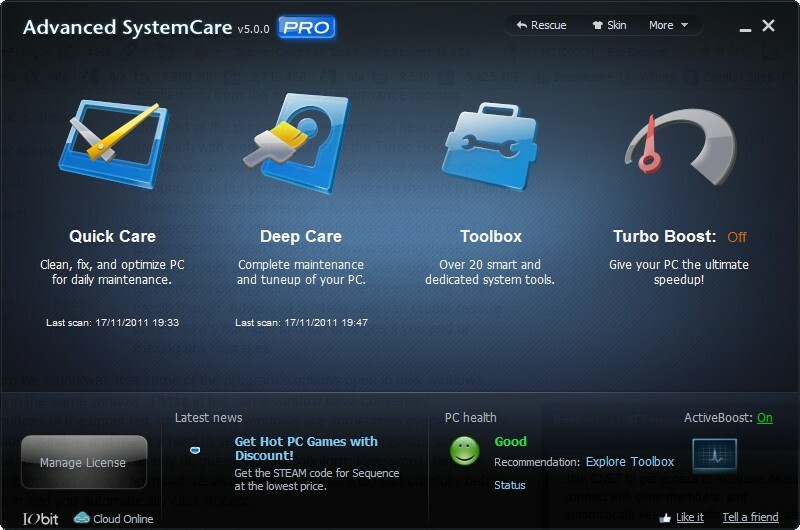 software utilitis yang cukup ringan, namanya Advanced System Care 5. Active Boost, technology that actively runs in the background intelligently managing system resources in real-time, constantly detecting inactive resources and optimizing CPU and RAM usage. The new “Could” technology ensures the database is kept updated at all times so that you can benefit from the latest definitions and configurations, which means your PC is better protected and optimized. These improvements will make your PC work more efficiently and steadily, stabilising even older systems. With the new UI technology, Advanced SystemCare 5 will start up faster using fewer system resources; this can assist in improving your PC’s stability. The brand new user interface allows you to adjust the basic settings from the main screen, making Advanced SystemCare 5 even more accessible and convenient to use. The new developments in the “Care” module include features such as “Start-up Optimization”, which will scan and clean your PC much more effectively. You now have two Turbo Boost options, Work Mode and Game Mode. In addition, you can now adjust the configuration of each mode from the main screen. Posted on December 24, 2011, in Uncategorized and tagged optimization functions, systemcare. Bookmark the permalink. Leave a comment.